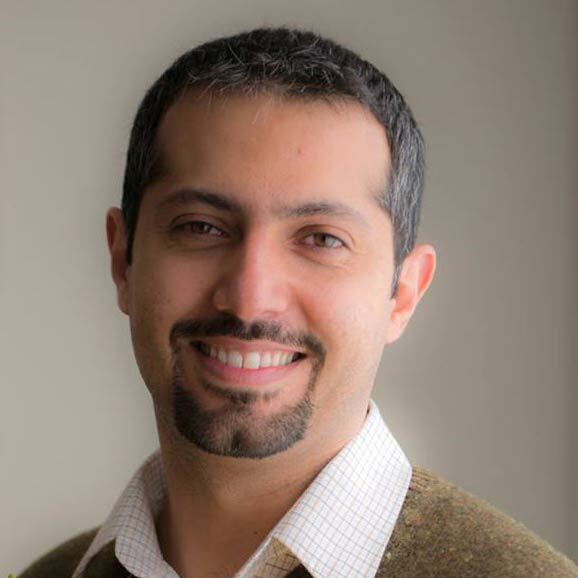 The sources told the Campaign that they were not certain which organization arrested Heidari, but added that he was likely arrested by the Revolutionary Guards Intelligence Organization. Heidari’s last cartoon was related to the terrorist attacks in Paris. 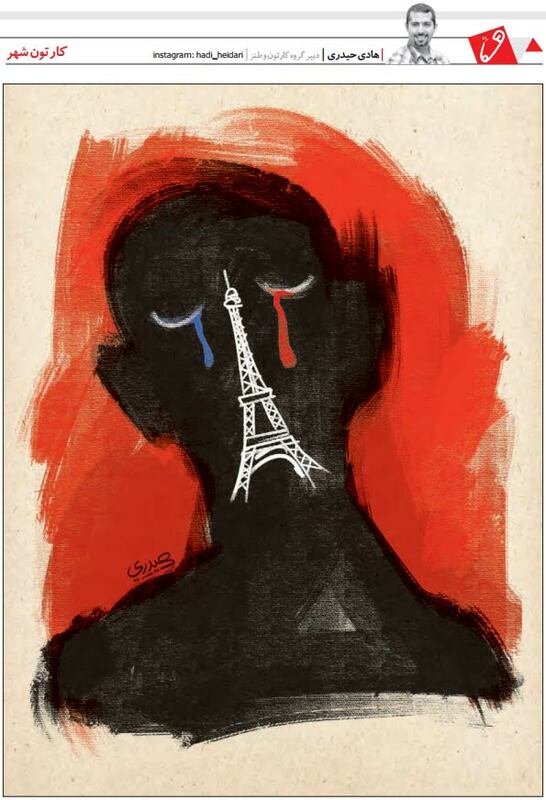 Hadi Heidari’s last cartoon was related to the terrorist attacks in Paris. Hadi Heidari, 38, is a graduate of Tehran’s Arts and Architecture University with a degree in painting. For the past twenty years, he has worked in various reformist publications in Iran, including Etemad, Bahar, Pool, Norooz, Neshat, Asr-e Azadegan, and Eghbal, among others. Heidari was first arrested in 2009 in the aftermath of the disputed presidential election on charges of “assembly and collusion against national security,” and spent 17 days in detention before release. He was again arrested in December 2010 on charges of “propaganda against the state,” and was released two months later on bail of about $15,000. 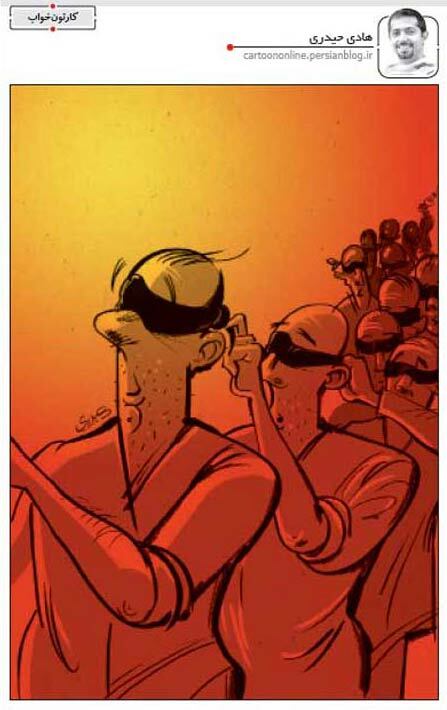 In September 2012, a cartoon by Heidari titled “The Blindfolded Men” and published in Shargh Newspaper, became highly controversial. 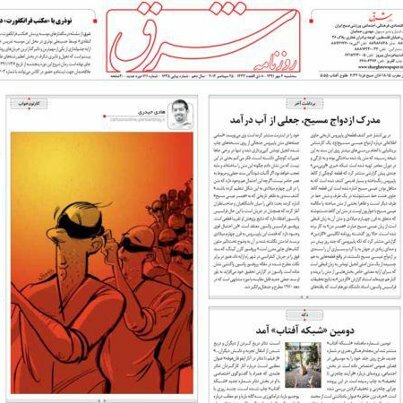 Following its publication and a concerted effort by 150 Members of the Parliament, state authorities, and clerics, Shargh Newspaper was banned on September 26, 2012, a day after the cartoon was published, and Heidari, was summoned to court. Mehdi Rahmanian, the newspaper’s manager and license holder, was transferred to Evin Prison. The authorities who objected to the cartoon stated that it was an insult to Iran-Iraq War veterans, but many believed this to be a mere excuse for banning the reformist newspaper in which it was published. The newspaper and Mr. Heidari were eventually acquitted of the charges on December 29, 2012, and Shargh resumed publication. During recent weeks, several Iranian journalists have been arrested by the Revolutionary Guard Intelligence Organization, in what has become an intensifying crackdown by hardliners. Ehsan Mazandarani, Managing Director of Farhikhtegan Newspaper, Afarin Chitsaz, columnist for Iran Newspaper, Saman Safarzaei, the International Editor of Andisheh Pouya publication, and Issa Saharkhiz, political activist and journalist, are some of the recent detainees whose arrests have been confirmed by the Revolutionary Guards.